Every page of a website contains different pieces of information such as entertaining or educational that is represented in the form of text and multimedia files. Enhancing the page with such kinds of things is essential because they can engage the customers for a long time. However, adding this kind of stuff more than a limit results in slow loading even with high-speed internet. For solving this issue, you need a tool that measures the accurate size of every web page and alter it accordingly. As the average internet speed is increasing globally, browsers are easily loading 25-30 kb of web pages. However, every location doesn’t have this level of speed which affects the market of a product of service. A web page size checker can tell you the size of a page in both bytes and kilobytes. It helps in identifying the stuff that is responsible for increasing reducing the speed. Developers can easily figure out and remove unnecessary content that has no significance. The size of the page is very important to load faster and ranking as well. If your page is overloaded with images and content, the size may increase in loading speed and makes user frustrated. 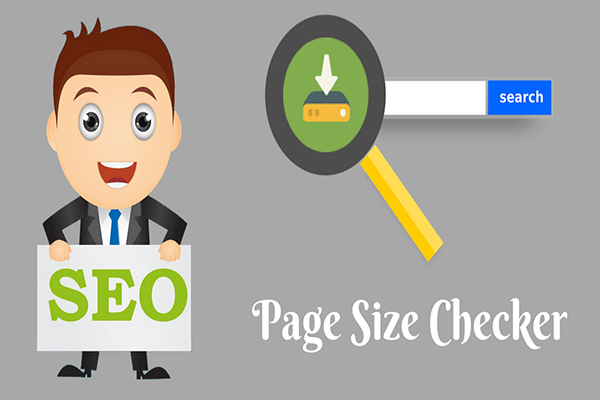 There is a need for checking every web page size using our free online page size checker tool and analyze the size of the pages to be reduced to smaller page size. Most of the professional blogs will write more content, plenty of high-quality images, HD videos, awesome web styles and other elements will take a huge amount of size to load the website quickly. In order to identify what is the exact size of each web page, you need a page size calculator to know the amount of kb is taken exactly. So, we bought a page size checker from Cool Seo Tools to identify exactly web page size and helps the website owners to make necessary changes to increase website speed. While doing digital marketing of an online business, the ultimate objective is to improve the user experience in order to improve their engagement on a web page. Whether a website is about selling products, services or providing information, its pages must contain engaging content in order to keep the user busy in exploring more and more. Many other forms of multimedia compatible with the uploading parameters of websites are also responsible for increasing the size. From the above information, it is clear that the size of a webpage decides its loading time period. If your website has heavy web pages, it would be very difficult to retain the visitors for a long time. Also, a large number of old customers will start looking for an alternative online portal serving in similar criteria. Now the question is how to solve the issue of the heavy webpage. The answer is hidden in page size checker tools. This is an online tool of very small size but perform a crucial job in maintaining the right size of every individual page. Some of the most reliable tools in this category are available online. All of them are online tools are powerful enough to measure the size of a web page accurately. If you are facing any kind of issue regarding the loading of the website, immediately check all pages. You may be thinking that who will wast too much time in checking every page one by one. Nevertheless, there are some tools available in the above links where you can add a maximum number of 20 links at a time. Paste them and process the tool for obtaining accurate data on every page. Why do we need the Page Size Checker tool? For the better tanking of a web page online it is important that users can access it without facing any issue. Nowadays, the competition among online businesses has become tougher than 5-6 years ago. Everyone is putting his/her business, thus; only survival of the fittest rule works here. If you are selling an excellent quality product but the web portal is not loading properly, the user will jump to another website immediately. Even after implementing all SEO strategies perfectly, you can draw the attention of potential customers to your website, not retain them if it is taking too much time for loading. It means, your entire hard work on search engine optimization will go worthless if the page is unable to load timely. This is the main reason why do we need a page size checker tool. After onboarding a new page on the website or updating the content of an already existing link, one must check the size whether it is tolerable or not. Check the loading speed on different networks such as 2G, 3G, 4G & optic fiber cable network. Measure the average time of loading. If it is irritating, immediately make important changes. A script may slow down the loading time which can be solved by shortening the script or using the webmaster tool by accessing the website cache option. For implementing all these operational activities, first, you need to know whether your website needs speed optimization or not. Check it practically on different network speeds and then measure the size of every web page individually. This is a simple, lightweight tool that is accessible through websites. If you measure the size of every page before launching it, the entire website will run fluently. It is a useful tool for both web developers to maintain the quality standard of website and SEO executives for better ranking on the search engine. It is very simple to use by copying entire web page URL and paste into the respective text box, click submit button. Within a matter of seconds, Our tool provides faster results of web page size in both parameters kilobytes(kb) and bytes(b). If your web page size takes more than 53 kb - 60kb, then you should probably decrease the size and meet the seo guidelines to improve the site loading faster, higher ranking and maintain a lower bounce rate of your website. How does the Page Size Checker tool work? When you open any of these online tools, a page will appear where you need to enter the web addresses. Always choose a tool that allows multiple pages monitoring at a time. It is obvious that a website will have multiple pages whether it is regarding any e-commerce business or just informative blog. In the empty space, paste the maximum number of links that are facing the issue of slow loading. Click on continue to execute the process & wait for a few seconds. You will see the results of every web page in a table where the size of the page is mentioned in both bytes and kilobytes. Compare it with the page sizes of other competitors to be sure that your website is faster or slower. For web developers, the page size checker is a very useful tool to examine the size after creating it. As mentioned above, there are multiple factors affecting the size of a page. They need to harness everything accordingly in order to provide browsing convenience to the end user. If the entire website or a part of it is slow, it will negatively impact on the user experience. The regular use of this tool helps in sharpening the skills so that the developer can create highly responsive web pages. Their main purpose of every website is to divert maximum traffic, engage them and turn them into customers. For this purpose, both organic and paid strategies are implemented. After their successful execution, one can expect better ranking which is good for business. However, the problem is, what if the highest ranked page is not able to load properly while browsing? This situation occurs when the pages are overstuffed with useless contents. Nobody wants to wait for loading a website after a few seconds and jump to the next option. It increases the bounce rate which is not good for any online business. For the success of all digital marketing strategies, your page must load rapidly. This is the main reason why digital marketers need page size checker tool. After updating new content on a web page, they can check the size in order to confirm that the end user will be able to access it flawlessly. After every update, it is essential to make sure that the page is working fluently as it was previously. Therefore, the page size checker must be a mandatory tool in the list of every marketer and developer.